With the Rivers Casino at Mohawk Harbor now a certainty for Schenectady, it’s time for this weblog to again broaden its focus. Although no longer called Stop the Schenectady Casino, we will still be “working to protect our community from casino-made problems.” But, we will also be monitoring City and County government in general, along with self-proclaimed neighborhood or community action groups, to see whether our public and private “watchdogs” are actually protecting our community, enforcing laws or by-laws meant to protect its populace and environment, or instead shirking their duties. All of our prior materials will remain, with links redirected to our new domain. 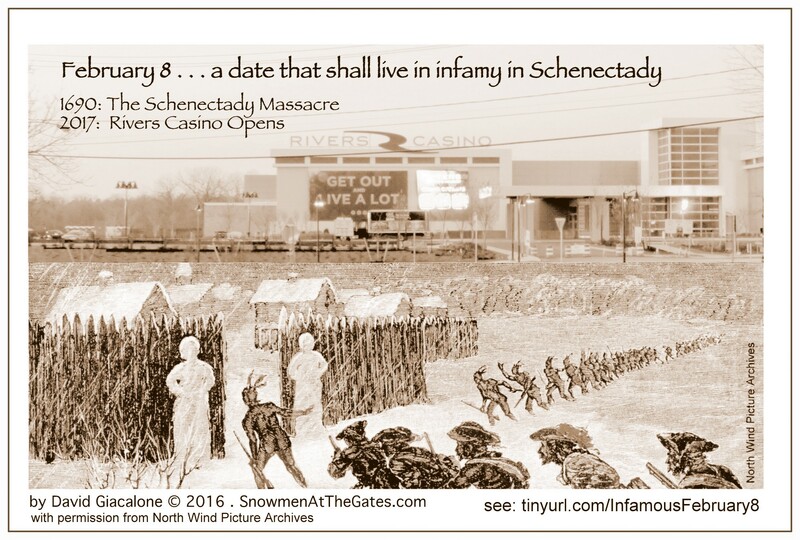 Ironically, two of our primary themes, Snowmen Leaders Allowing Danger to Enter Schenectady and Becoming a Casino Town, were further linked by the decision of Rush Street Gaming to open the Rivers Casino on February 8, 2017, the anniversary of the 1690 Massacre. See “our infamous February 8th“. David Giacalone is the editor/proprietor of this weblog, and is solely responsible for all original materials, unless another author is otherwise noted. You can contact David by leaving a Comment.